"Of all the antiquities within the Lodge, the Volume of The Sacred Law is the most important. The Great Light in Masonry, and The Rule and Guide for Masonic Faith and Practice is placed on the Master’s pedestal when the Lodge is opened, where the meetings are conducted in peace and harmony. In the Book of Genesis it printed the line ‘made themselves breeches’ instead of ‘made themselves aprons’ and henceforth became known as the ‘Breeches’ Bible." Bound in London in 1767, this Bible was brought to the colonies and given by Jonathan Hampton to the St. John’s Lodge in lower Manhattan three years later when he became its Grand Master. Just before Washington was to take his oath of office on the steps of Federal Hall in New York City on 30 April 1789, it was discovered that there was no Bible on hand. The then New York Governor, Robert Livingston, a Masonic Grand Master, borrowed the Bible from St. John’s Lodge, which had meeting rooms just a short distance away. A statue of Washington marks the site in front of the present-day Federal Hall on Wall Street. Many Lodges may not have realised that they may be custodians of hidden treasures. Many innocent-looking VSLs could turn out to have very interesting histories. On a visit to Mother Kilwinning Lodge No. 0, I was shown two 16th century Geneva Bibles that had been stuck together with duct tape. These and other Masonic artefacts need to be sensitively restored to retain their value and preserved for future generations. The book has been fully restored and bound in the colours of the masonic order of Holy Royal Arch. The purple and scarlet colours are derived from hand-made vegetable dyes taken from ancient recipes. The gilt decoration is reproduced exactly as the original front and rear covers that have been lifted restored and incorporated inside the book. 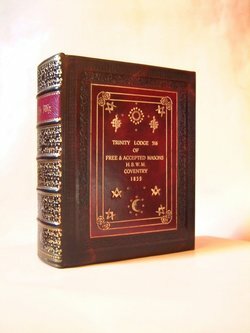 This book is a personal Masonic record of your journey through the Craft and all the other Orders from your initiation thru to Master of the Lodge, recording your Lodge Name and Number, dates of initiation, passing and raising, proposers, etc., allowing you to record your advancement through each office within your lodge. The book has been reproduced from the only existing copy of a List of Lodges that date from 1717 to 1769 containing the first four hundred Masonic lodges around the world consecrated by the Grand Lodge of London. The List of Lodges was found by the librarian of a provincial Masonic Temple, and was taken to Period Fine Bindings for restoration, and later permission was granted for it to be reproduced. Printed on a quality laid paper and carefully aged to reflect the original, also incorporating a modern-day Masonic journal listing all the orders, interleaved with blank leaves to document your progress through the orders printed to your own specification. Each page of the list is decorated with beautiful woodcut illustrations depicting Lodge names, dates of meetings and consecration. 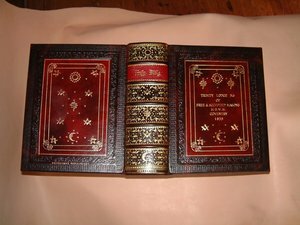 This superb full leather binding is individually hand-made to order using the finest materials, hand-marbled end papers, blind tooled borders, gilt Masonic devices. This is a subscribers edition only to order in which your name, your Lodge and Lodge number embellished in 23 carat gold leaf in Saxon black letter type face on the front cover.